It is important to keep your head up and follow what you believe is right. All India radio was worldwide. America makes up its own mind about what it wants to see. I applied to American Repertory School up at Harvard at got in. I got heavily into the drum-and-bass scene, which is really wicked. It is important to make your own stuff. Even if you are not an actor, it is important to not stop involving yourself as a creative person. I love films for the fact that it is like working under a microscope. It is sort of like a laboratory. I think that I have sold out sometimes. I think that rap is narrative, when it’s done right. I want to present interesting stories that don’t qualify themselves just by virtue of their ethnographic type. My family was very supportive of my acting. They didn’t really have a choice because I got jobs acting before anyone could really say anything. It paid my way through college and helped my family out. I had been working early in my life in films – since I was 11. I hear music as narrative. I like the theatre because you paint with broad strokes. To me the theatre is stretching its definition really far. We make a contract within ourselves as actors or directors or writers about how much of ourselves we let into projects. You can actually figure out before you work on something how much blood you will have to let emotionally. There’s got to be something greater than us. 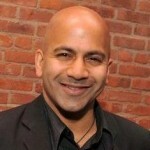 Ajay Kalahastri Naidu is an Indian-American actor. Naidu's parents came from India to the United States in 1964. Naidu was born in Evanston, Illinois. He attended Evanston Township High School. He trained with the American Repertory Theater's Institute for Advanced Theatre Training at Harvard University. His first professional acting job was the film Touch and Go released in 1986 which he won from an open call. In 2006 he directed his first feature film Ashes which had its release in 2010 and for which he won Best Actor accolades from both the MIACC Film Festival in New York, and the London Asian Film Festival. His most recent Theatre credits include The Master and Margarita with Theatre Complicite, A world tour of Shakespeare's Measure for Measure with Theatre Complicite, The Resistible Rise of Arturo Ui alongside Al Pacino, directed by Simon McBurney and The Little Flower of East Orange alongside Ellyn Burstyn at New York's Public Theater directed by Phillip Seymour Hoffman. In 2001 Naidu's solo theatre piece Darwaza was a sold out hit at New York's Labrynth Theatre.